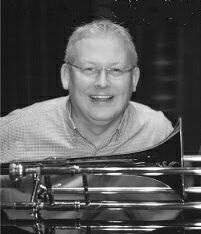 j Trombone player Mark Nightingale has played and recorded with many top jazz names as well as appearing at clubs and festivals around the country. He has recorded with Tommy Whittle, John Dankworth, Kenny Wheeler, Stan and Clark Tracey and Alan Barnes among others. He first recorded in 1980 with the Midland Youth Orchestra and from 1983 to 2001 recorded with the National Youth Jazz Orchestra. Through the early 1990s he made a number of big band recordings including the BBC Big Band and Colin Towns and also recorded with his London Trombone Quartet. Mark Nightingale (tb), Scott Hamilton (ts), John Pearce (p), Dave Cliff (el-g), Dave Green (b), Steve Brown (d). Get Happy/Four/Lonely Moments/Serenade To Sweden/Our Delight/Change Partners/Tee Pee Time/Isfahan/Taking A Chance On Love/In Walked Bud. Mark Nightingale (tb), Kelvin Christiane (ts,ss,fl), Alex Hutton (p), Rob Rickenberg (b), Matt Home (d). Tommy Whittle (ts), Mark Nightingale (tb), Richard Busiakiewicz (p), Jim Richardson (b), Bobby Worth (d). Crazy Rhythm*/A Lady's Vanity*/Old Reliable*/The Things We Did Last Summer*/Waltz For Barbara*/Three O'Clock In The Morning*/In The Clear*/Too Close For Comfort*/Perhaps, Perhaps, Perhaps*/In Lester's Scrapbook*/Bo Bi My Boy*/Trotting*/Sweet And Lovely*. This CD with fellow trombone player Alistair White, recalls the music of J.J.Johnson and Kay Winding who led various size trombone groups to much acclaim through the 1950s. Mark Nightingale, Alistair White (tb), Graham Harvey (p), Alec Dankworth (b), Clark Tracey (d). This Could Be The Start Of Something big/The Groove Merchant/Judy/Blues On The House/Cherokee/Mad About The Boy/June Time/This Can't Be Love/A Gentle Man/Pick Yourself Up/What Is This Thing Called Love/Perdido.